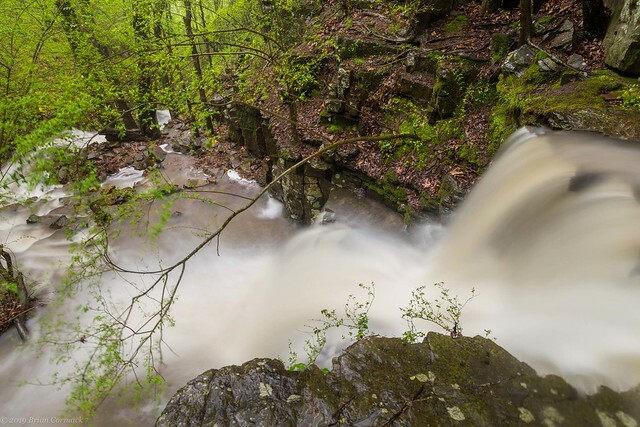 It seems like most of the waterfalls in Arkansas are congregated in the Ozarks and Ouachitas, but there are a few of them hiding right here in the middle of the state. 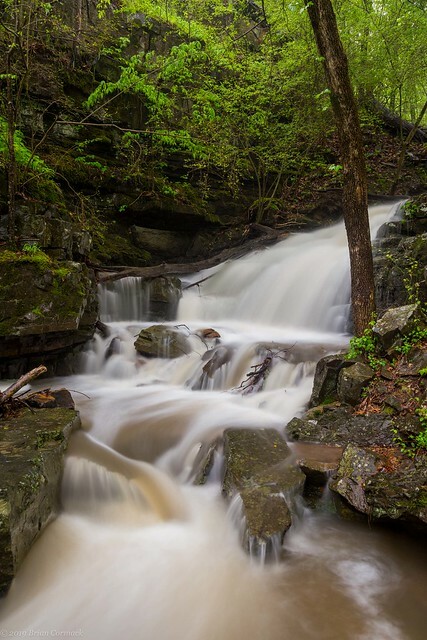 Emerald Park in North Little Rock is home to a neat little waterfall (called Emerald Park Falls or Dogtown Falls), which I decided to head out and pay a quick visit to last weekend while it was pouring rain. 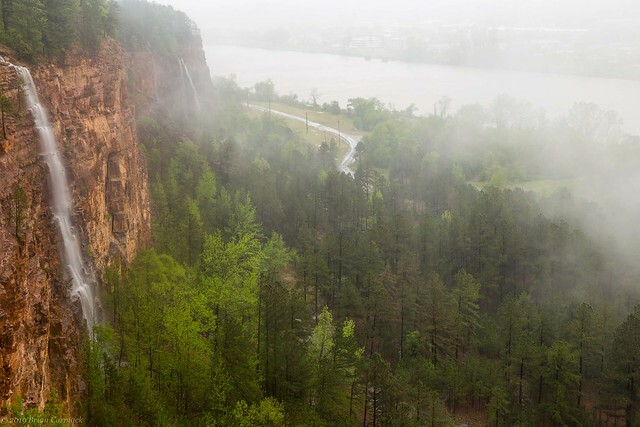 The falls are on a small creek that runs down the side of Big Rock towards the Arkansas River. The falls are about 20 feet tall or so (I'm guessing), and spill down in a few different levels. The water in the creek was running high and muddy - it was pouring rain when I took these (while trying to unsuccessfully shield the camera with an umbrella). 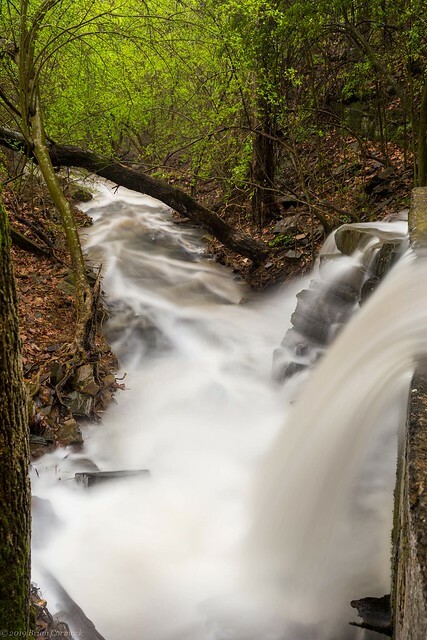 And one more shot of the creek, as it pours over a concrete wall and hurries on its way towards the river. Emerald Park sits on a hill that was named in 1722 by French explorer Jean-Baptiste Bénard de La Harpe, who deemed it "Le Rocher Français” (the French Rock, it was later renamed Big Rock). He also named a nearby outcrop of rock "le Petit Rocher" which would later become Little Rock. The Big Rock site would see a lot of different uses over the years. The army would establish a base here, Fort Roots, which is now a VA hospital. But a good chunk of the hill was taken away when it was used as a quarry. During heavy rains, there are few more waterfalls in Emerald Park. Water streams over the cliffs in the park, creating a few waterfalls that are probably about 200 feet tall (I'm guessing - I didn't go out there with a measuring tape like Tim Ernst does in order to get an accurate measurement). Before heading home from Hot Springs, we made one last stop at Garvan Gardens. 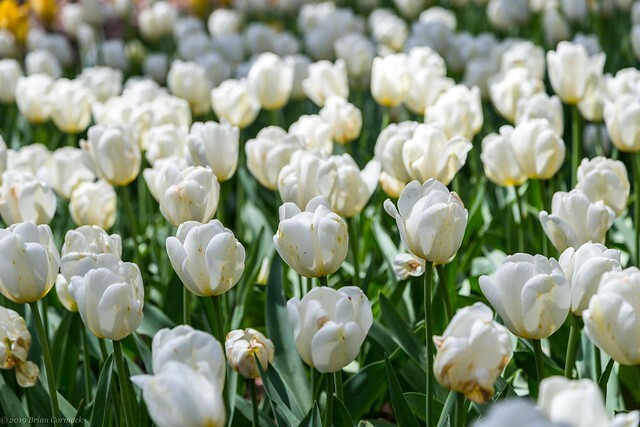 The gardens encompass about 210 acres of land along a peninsula on Lake Hamilton, and include a wide variety of flowering plants (from trees to flowers to shrubs). There are even 160 different types of azaleas on display there. 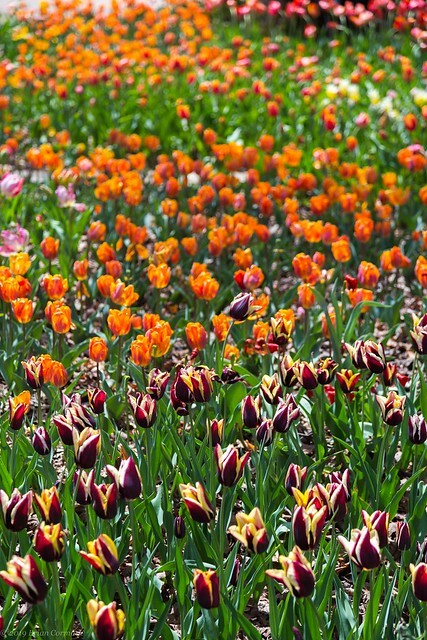 The gardens are one of the biggest tourist attractions in Hot Springs, with about 125,000 annual visitors. The gardens were pretty crowded during our visit, and with good reason. 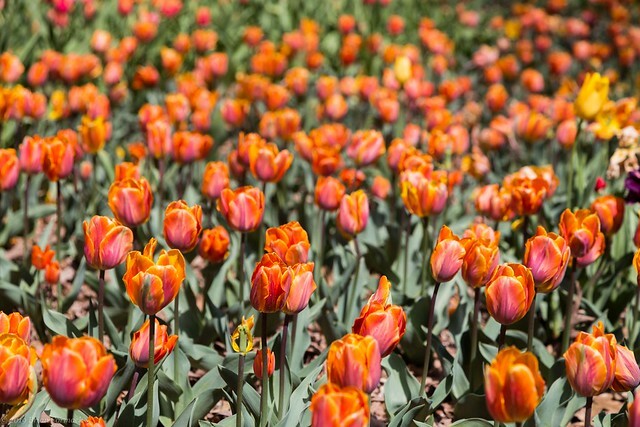 The thousands and thousands of tulips were all blooming, and the grounds were covered in a sea of flowers. The light was a bit harsh during our visit - it was sunny - but I tried to get a few pictures (along with everyone else). There were a lot of people out there trying to do family pictures, with their kids all in matching outfits posing next to the flower beds. We were there without Jonah so I was relieved we weren’t joining the throngs of parents trying to get pictures of their kids next to the flowers. We could have easily been one of those parents trying to coax a toddler to be still for a picture while also keeping him from falling into and trampling all the flowers. 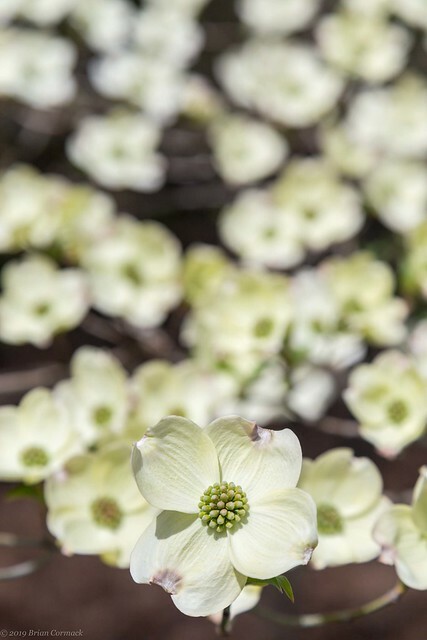 The tulips weren't the only things blooming - the dogwoods were also putting on a good show. Of course the flowers aren't the only things to see there. 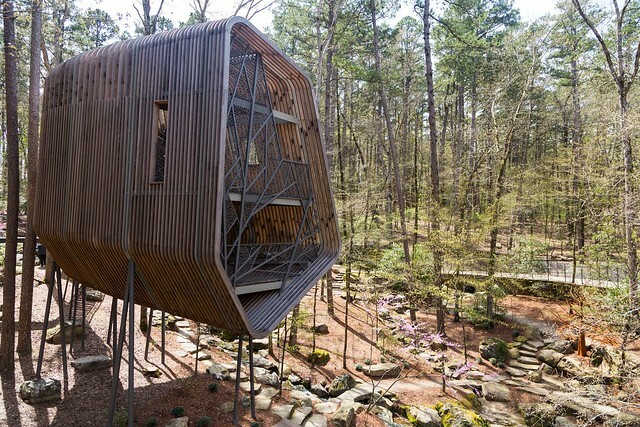 The gardens recently opened a new treehouse, which cost about $1 million to construct. Another highlight of the gardens is the Anthony Chapel, which opened in 2006 and cost $5.6 million to construct. 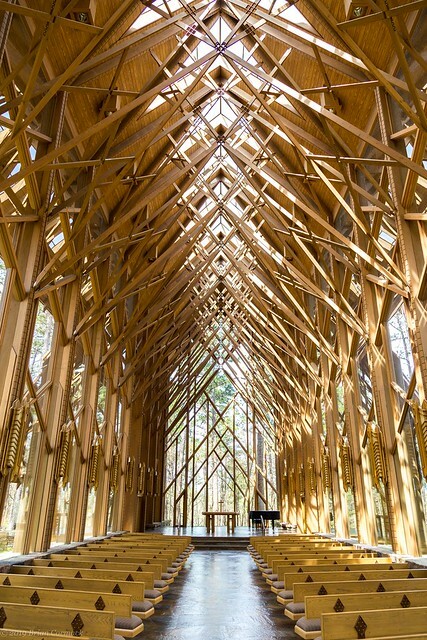 The six-story wood and glass chapel is beautiful, and would be a great place for a wedding. And one last shot, of the Anthony Family Carillon. 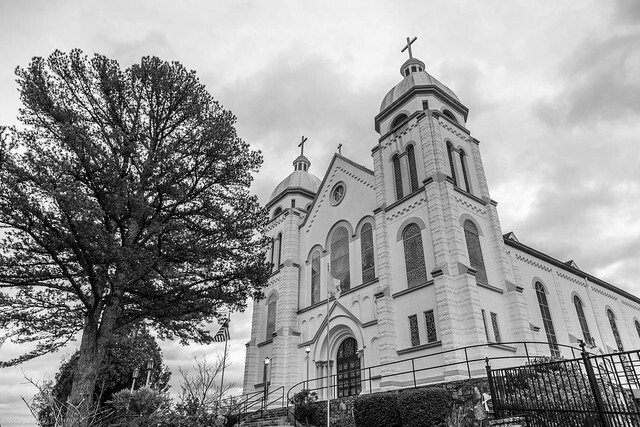 The 57 foot-tall electric bell tower stands right by the chapel. We were spending the weekend in Hot Springs, so on Saturday we headed back out to explore the city some more. It was rainy and dreary, so the photos taken kinda reflect that a bit. But we had a great day there - we had two amazing meals. Our lunch was at Grateful Head Pizza which I think might be one of the best pizza places in the state. Then for dinner we got steak at The Vault and it was amazingly good. We were able to get a table along the "Chef's Row," so we spent our time there admiring the food and feeling like we were part of a cooking show. The chefs working there actually didn't seem to mind, and treated us to a lamb lollipop with a side of risotto that was awesome. We will definitely be going back soon to Hot Springs just to eat. We drove by a few of the older hotels in Hot Springs which might be showing their age a bit. 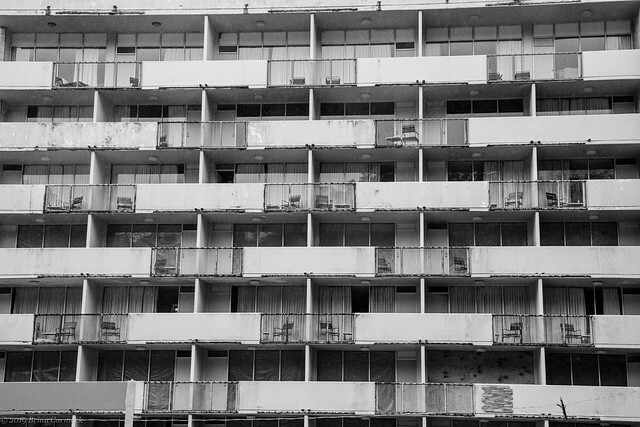 This is the back of The Springs Hotel, which opened in 1965 as the Downtowner Hotel. 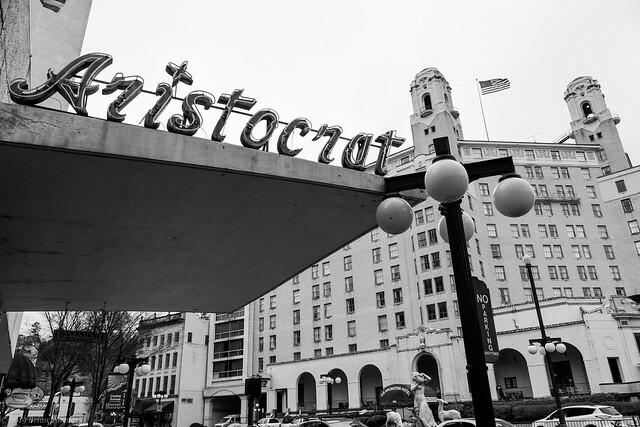 Back then it was a bright and modernist entry into Hot Springs eclectic architectural collection. 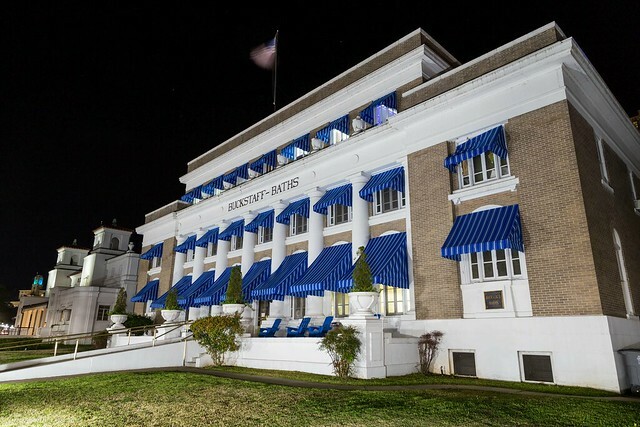 According to the Encyclopedia of Arkansa History, the hotel was touted as being "a European beach hotel without the beach" and had rooms with five different style of decor - "English, Spanish, country French, contemporary and Oriental." 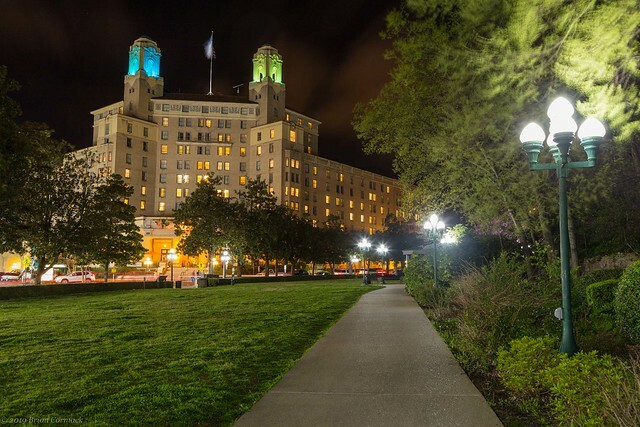 The hotel is listed on the National Register of Historic Places and it is rumored that there are plans to redevelop the property. 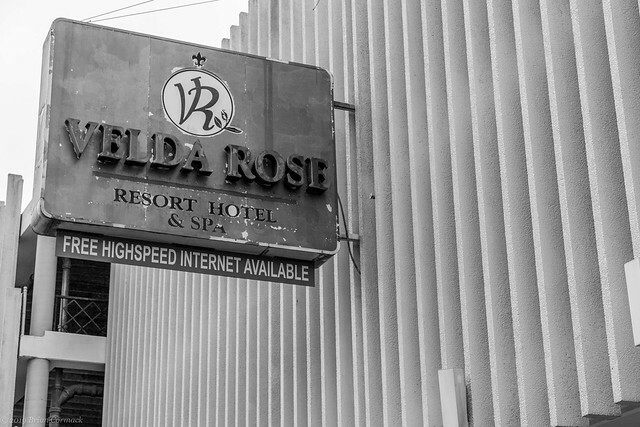 Just up the road on Central Avenue is another modernist hotel, The Velda Rose. 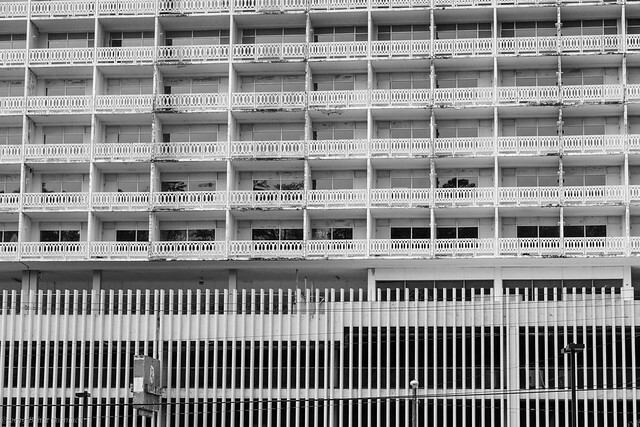 The hotel opened in 1960 but is now closed and empty. I wouldn't be shocked if some plans were soon announced for the Velda Rose, since it sits right next to the site of the former Majestic Hotel. That land is an empty lot now, but one idea for the site would be to put in a plaza and a thermal pool complex that showcases the famed hot springs that made the city famous. During this visit I was really impressed with how much the city has changed, and how promising its future seemed. There seem to be boundless potential for the city and how it can change to be a better attraction. One idea that probably couldn't happen, but I wish they could maybe open up some of the springs (which are almost all capped to prevent contamination) and expand the places where people can see the actual hot springs in action. And one shot taken while walking down Central Avenue, next to the old Aristocrat Motor Inn. The hotel was built in 1963 and closed in 1978 and is now used for housing. 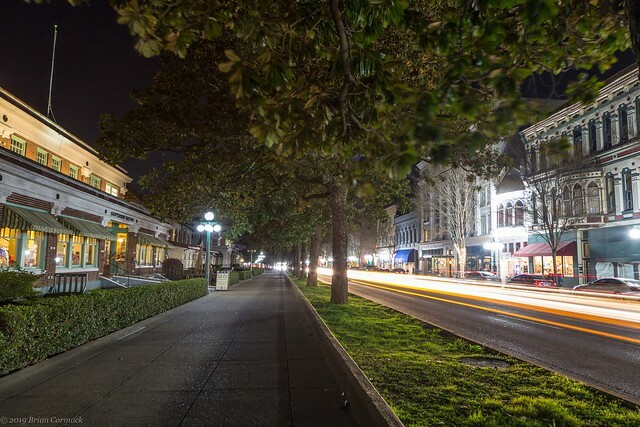 In the distance is the Arlington Hotel. During our visit, we stayed at the Best Court Motel along Ouachita Avenue. 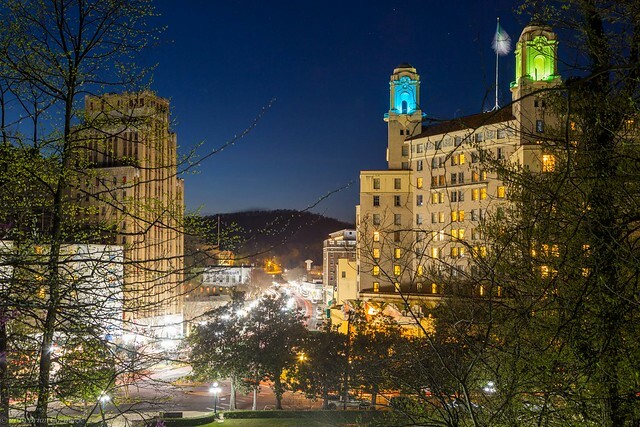 The hotel was built in 1933 but recently underwent a massive renovation into a modern hotel that still showcased the architectural details of the historic property. The rooms have an attached garage, which were actually designed for Model Ts so they couldn't fit our car (but perfect for bikes or kayaks if you brought those). We loved our stay there and would heartily recommend it (and no I'm not getting paid to say that either!). There are a bunch of old motor courts like this in Hot Springs, which all were built between the 1930s and the 1970s. It would be great to see these old motels fixed up (or at least their old neon signs restored) to cash in on some of the old heritage tourism that attracts people to old motels on Route 66. We did have one small quibble with the hotel, although its wasn't really their fault. The hotel is right next to the St. John the Baptist Church, which is a very pretty old church (it was built in 1912). We had sent Jonah off to stay with family while we were in Hot Springs, so we were looking forward to a weekend without having to accommodate a toddler. Which meant not having to watch Paw Patrol, and also getting to sleep in (Jonah likes waking up around 5:30 to 6:30 now). So we were a little annoyed to discover that the Catholic Church had decided to do a calavacade of their bells on Saturday morning at the bright and early time of 6 AM. Why would you do that??? I wonder what some people think when they visit Hot Springs. Are they thinking that it's going to be some massive National Park like Yellowstone? Or one filled with vast landscapes and herds of wild animals? 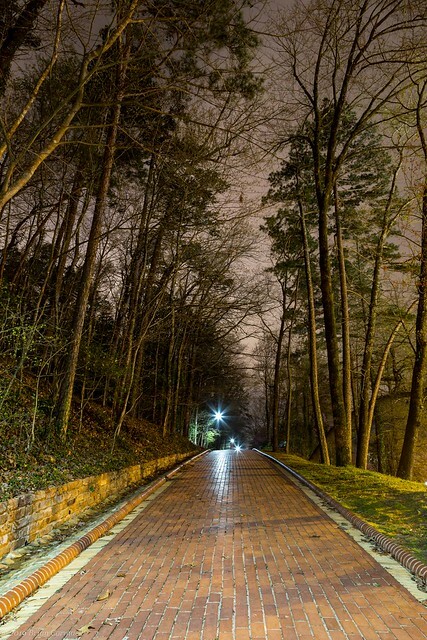 Hot Springs National Park is many things, but it is not a pristine and unspoiled wilderness. 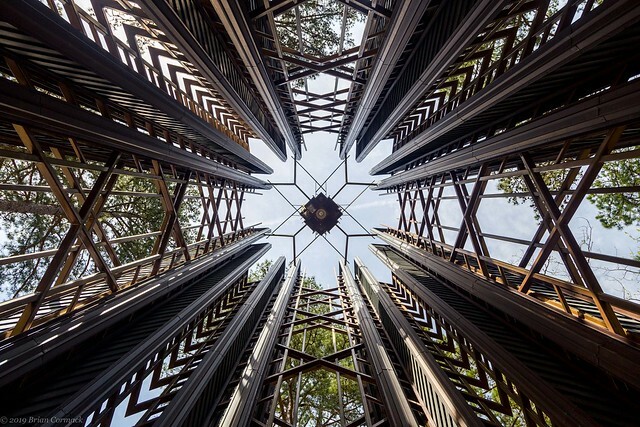 It is small and surrounded by a city, and most of the wildlife you see are wacky tourists and locals (who can be just as entertaining as what you'd see out in nature). But what Hot Springs really excels at is history and architecture. 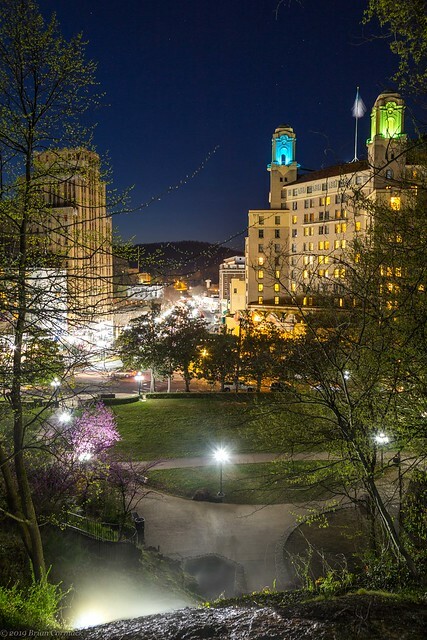 In terms of just history, Hot Springs might be one of the most unique national parks in the system. The park is technically the oldest national park - the 47 thermal springs were first protected by the federal government in 1832 (40 years before Yellowstone and before Arkansas was officially admitted as a state). The city that grew up and around the springs became a famous spa, attracting millions of visitors over many decades. It also helped that illegal gambling was rampant in the city. The gambling ceased in the 1960s, which coincided with people deciding that they didn't need to take long intensive baths to stay healthy. 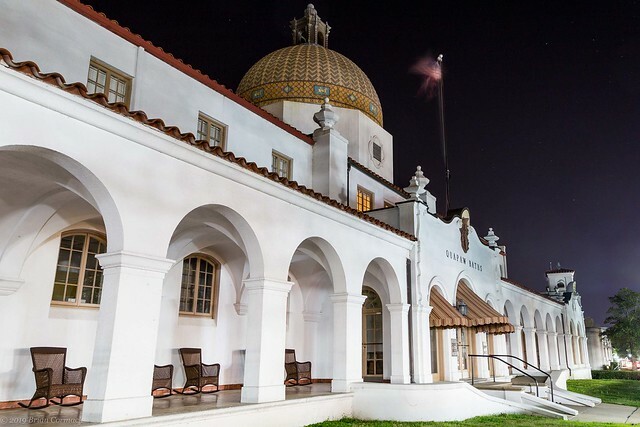 So while Hot Springs remained a tourist town (thanks to the Oaklawn horse track and nearby lakes), only one of the opulent bathhouses would remain open. They would sit empty for awhile, until the National Park Service instituted a program that renovated and opened them up to new life. Now the bathhouses are home to shops, spas, galleries and even a brewery. I'm really fond of Hot Springs - there are tons of neat things to take pictures of there. 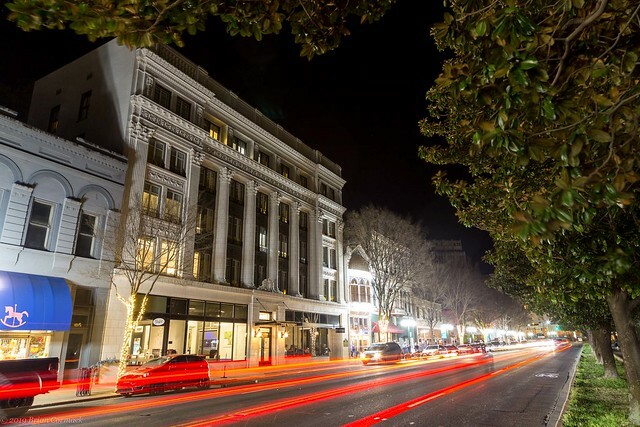 We recently spent the weekend in the city, and on Friday night went and walked along Central Avenue. Besides the fancy bathhouses, there is tons of neat architecture to see along Central. 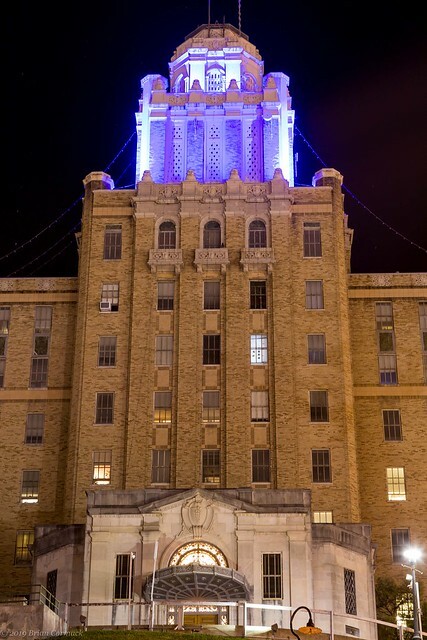 One of my favorite buildings in Hot Springs is the Old Medical Arts Building. 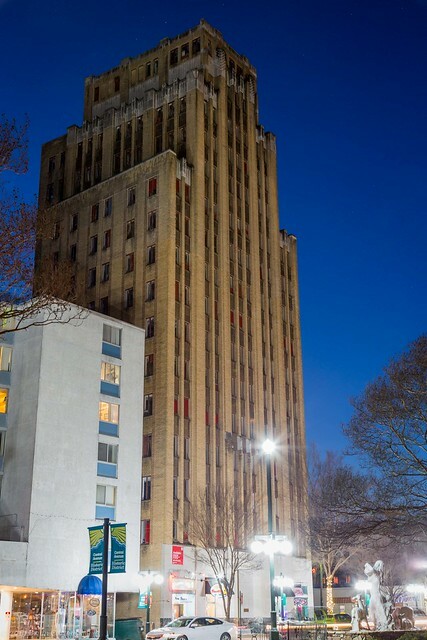 It was built in 1930 and was the tallest building in Arkansas until 1960. But now, all but the first floor of the building is empty and unused. But hopefully it can be renovated soon enough (for more pics of the Medical Arts Building, click HERE). From there I scurried up the sidewalk that steeply goes up the hill, and got a few shots from the Grand Promenade. This is the view looking down at the Medical Arts Building, Central Avenue and the Arlington Hotel (which was built in 1924). This was actually taken right above the display spring, and you can see some steam rising up at the bottom of the picture. And the view looking down Central Avenue, with the Superior Bathhouse on the left. The bathhouse is now a brewery, which uses the thermal spring water in their beer (which is also really good). The bathhouse was built in 1916 and operated until 1983. And another shot of Central Avenue, with the kind of traffic you'd expect on a Friday night. In this shot you can see the Waters Hotel and the Ohio Club. Further down Bathhouse Row is the Quapaw Bathhouse, which was built in 1922 and operated until 1984. In 2008, it reopened as a modern spa. The only bathhouse to have never closed is the Buckstaff Bathhouse, which opened in 1912. If you like, you can take a bath there just like people used to in the 1930s. At the far end of Bathhouse Row you can see the massive Army and Navy Hospital, which was built in the 1930s. The hospital was the nation's first military hospital, originally opening here in 1887. Over the years the hospital treated a wide variety of patients, including Al Jolson, Helen Keller and General John Pershing. In 1960, the federal government sold the building to the state of Arkansas and it's now used as a Rehabilitation Center. Walking back I passed through the Arlington Lawn, which got its name because it was actually the site where the first two Arlington Hotels were built. The very first hotel was built here in 1875, which was then replaced by a newer structure in 1893. That building burned to the ground in 1923, causing an estimated $1.6 million in damages (in 1920s money, that would be about the equivalent of $23 million today). 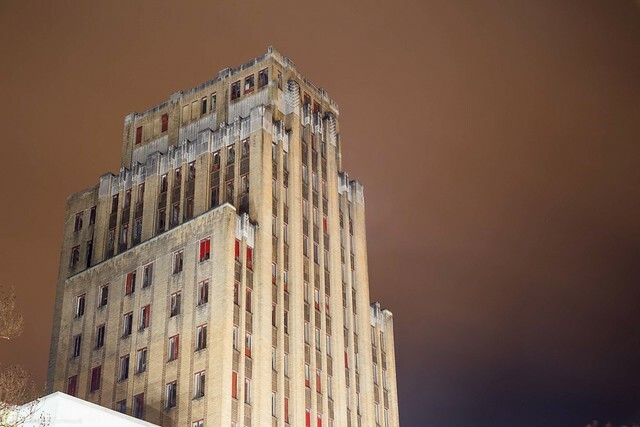 And one last shot of the Medical Arts Building, as a few clouds drifted by. And then one last shot from the night, from along the Grand Promenade which runs along the hillside above the bathhouses. 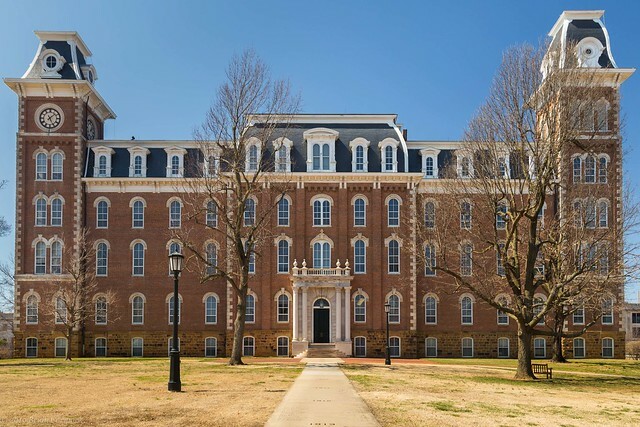 We recently headed up to Fayetteville for the weekend to visit family, and before heading home I stopped at the University of Arkansas campus to get a few pictures of Old Main. It was Spring Break, so there weren't any students around, so no one randomly called the hogs while we were there. 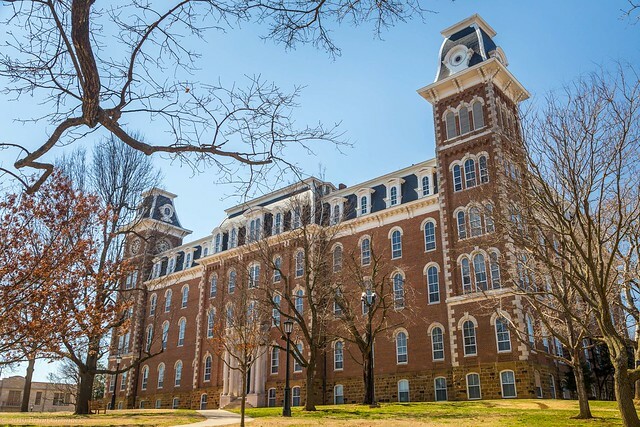 Old Main was built between 1873 and 1875 and is the oldest building on the campus. The building closed in 1981 and there was a debate on whether it was best to tear down the aging building or to renovate it. Fortunately, it was saved and renovated and reopened in 1991.